Last Chance Call for Margarita Day! February 1 is the last day to sign up for the first installment of the Faux Holidays Club, Margarita Day! 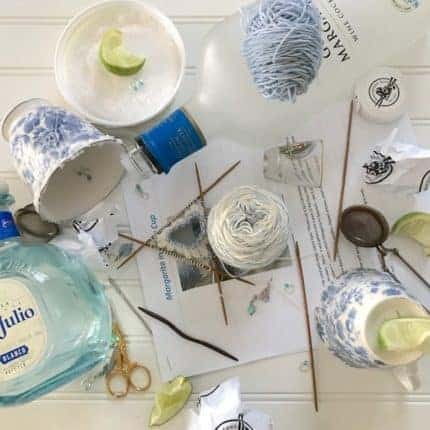 This one-of-a-kind club curated by Despondent Dyes features a very special skein of self-striping yarn with heel and toe mini, a pattern written for the yarn and some fun goodies centered around a comforting beverage. And we get why you might be holding out — you don’t like surprises, you like your yarn with security. You like your cake naked, so you can see the filling. You never let anyone else put milk and sugar in your tea. But we promise, if you take a chance on this skein of self-striping yarn, you will not be disappointed! And this is just the beginning — there are three more Faux Holidays after this, and trust us, they are gonna be soooo good.